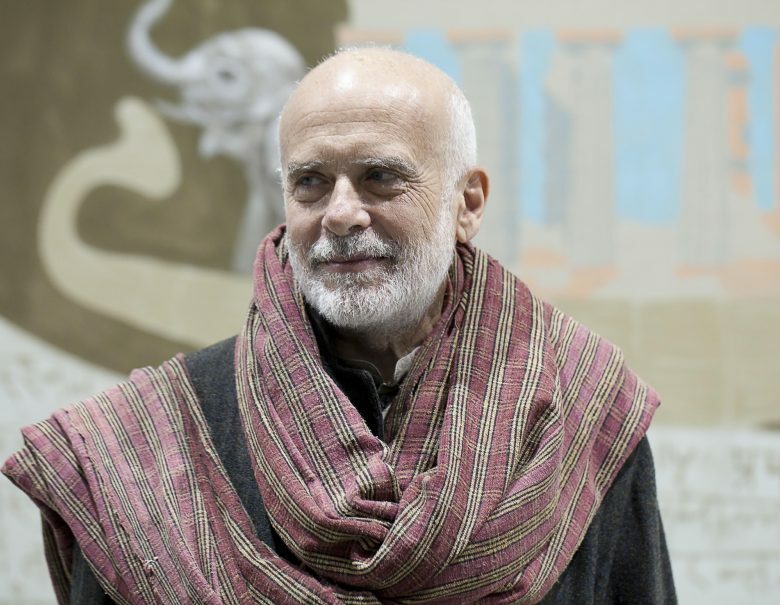 The directors of Blain|Southern are delighted to announce an exhibition of new works by Francesco Clemente, Mandala for Crusoe, the artist’s first London show in seven years. This recent series brings together 14 paintings which continue Clemente’s singular pictorial language, gathering together myriad cultural references and merging timeless symbols, iconic imagery and philosophies. Inspired by the symbolism of the originally Buddhist and Hindu Mandala, this form, combined with allusions to more classical and mythological tropes, becomes apertinent description of the world as a whole, now and throughout history. Eastern spiritual traditions identify the mandala as a conduit to a deeper level of consciousness, allowing the meditator a sense of oneness with the cosmos. 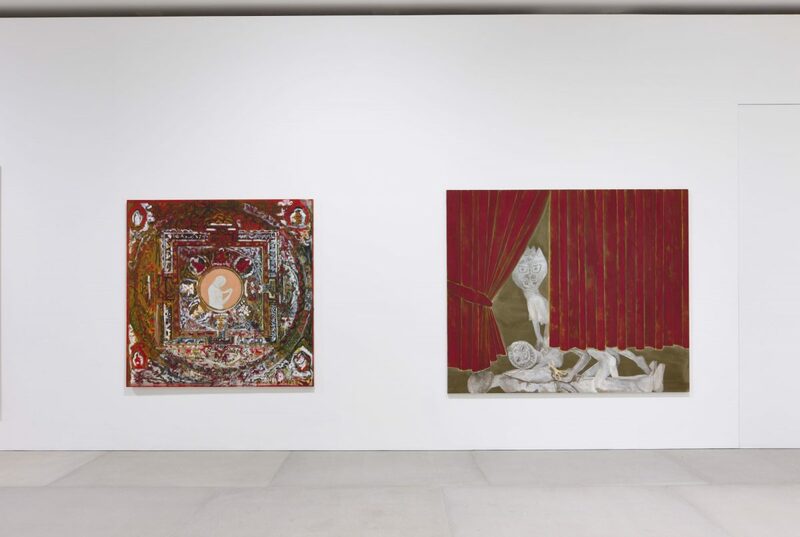 Conversely, at the centre of Clemente’s mandala is the empty, mundane life: a man smokes as he reads a newspaper, while another busies himself with digital technology. However, it is from this emptiness that a world of imagination arises. Indeed, the artist affirms the objectivity of the imagination not as sentimental fantasy, but as a function of the mind that leads to a harmony with both the self and others – a necessity for life. 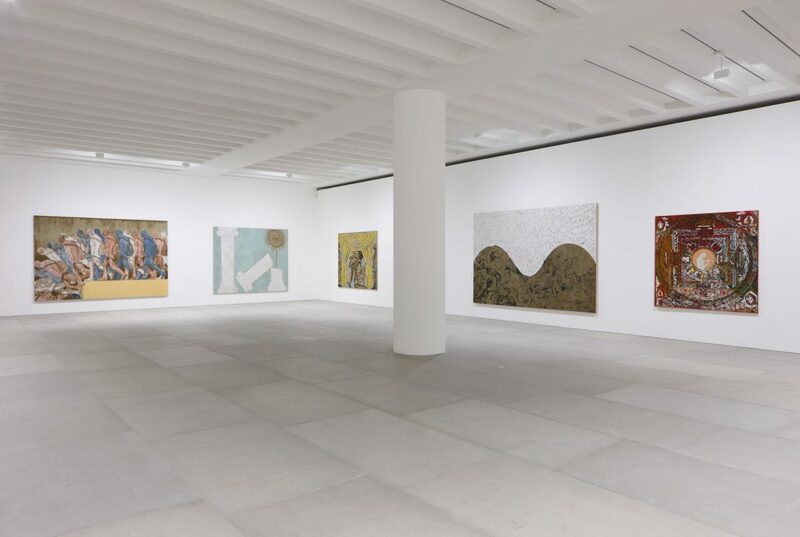 The group of exhibited paintings are thus Clemente’s tools; like Crusoe shipwrecked in isolation, he composes and narrates a belief in a common experience free of cultural divides or contemporary materialism. 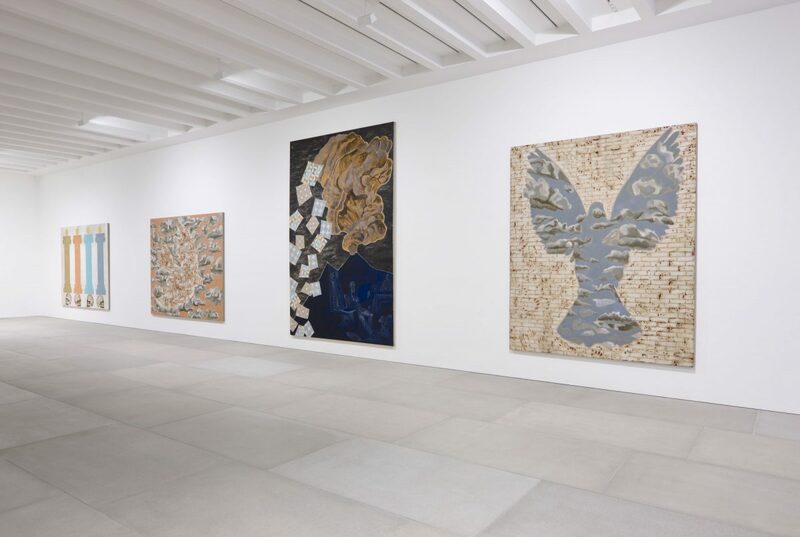 Since the 1970s, Clemente has divided his time between New York and Varanasi in India, feeling a nomadic affinity with the contemplative visual tradition of both the East and West; while the roots of his painterly vision are in the frescoes of the Italian Renaissance, historical Indian imagery and the Romanticism of William Blake are equally pervasive. 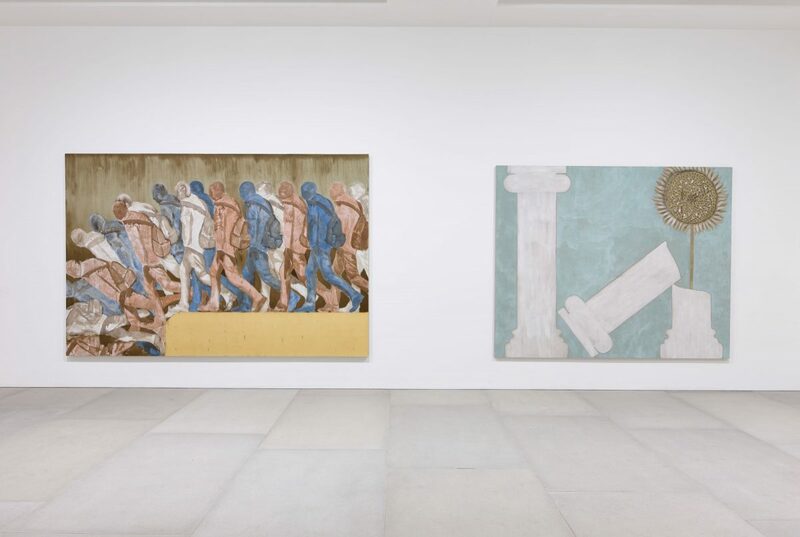 This is particularly evident in works such as Candy and Chloe at the gate (2012), which portrays a scene where the Warhol starlet, Candy Darling, performs alongside the modern-day actress Chloë Sevigny, and The Ark (2012), where a chorus of animals from Noah’s ark sit atop an ancient Greek temple and float upon a sea of Sanskrit text. 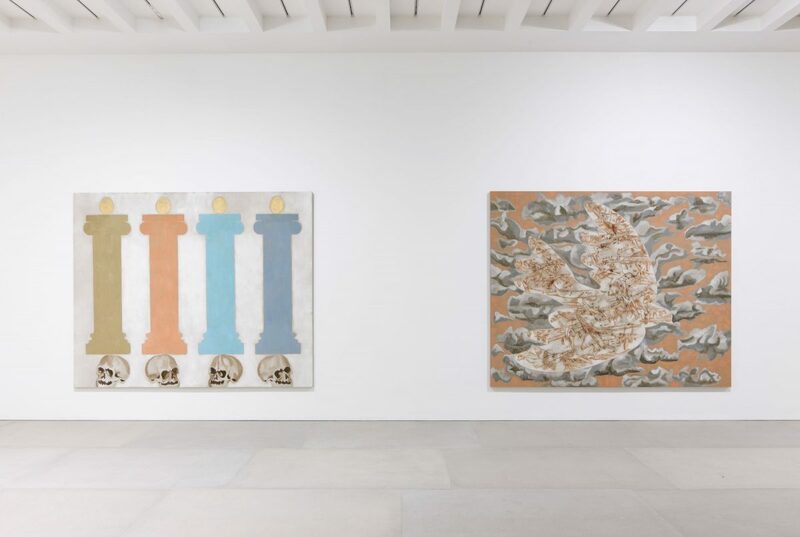 Clemente’s use of materials is equally heterogeneous, utilising raw linen, milk paint, verdigris, silver pigment, mica, oil sticks and lithographic ink, which are combined in different permutations. 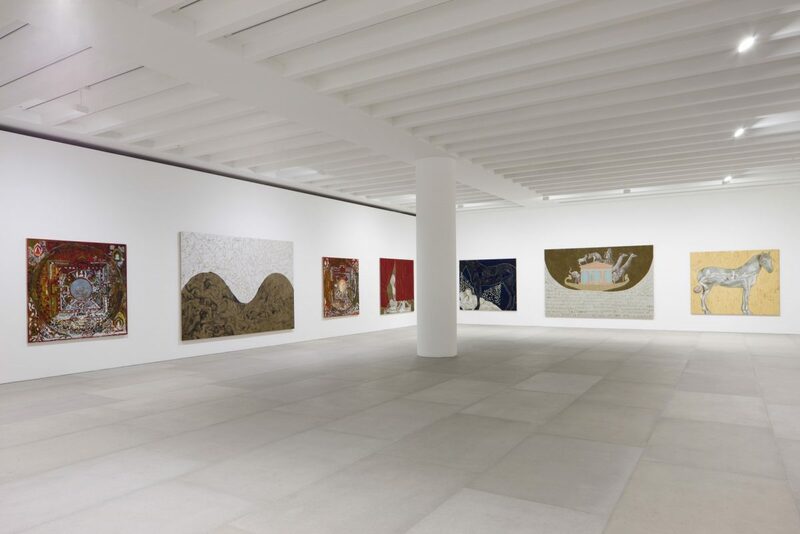 They create a variety of painterly surfaces, which mirror his notion of the self as a fragmentary experience where the only constant is ‘the continuity of discontinuity’, which in itself reflects the principle of the Mandala, which states that ‘what is here is elsewhere, what is not here is nowhere’.